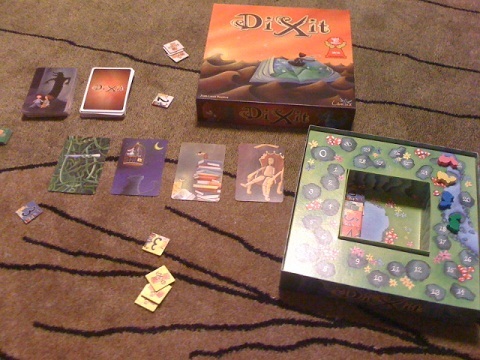 A game that I recently played strictly based on the online reviews I had read was Dixit (honestly, when I looked at the game at the store, I thought it looked stupid; but I bought it anyway). In full disclosure, party games are not really my favorite genre. They can be fun occasionally, or in the right setting, but for the most part, I'd rather play a strategy game. However, when I went to visit some friends, Dixit seemed much more appropriate than a 2-3 hour mental workout game. 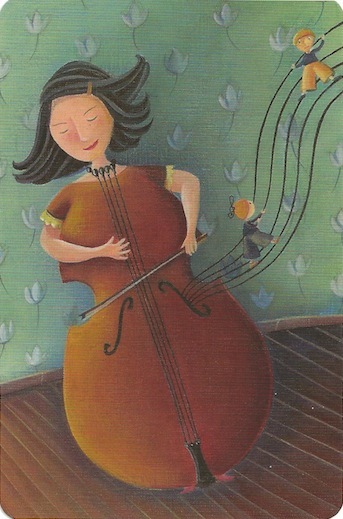 In Dixit, players each have 6 cards with weird pictures in their hand. They take turns being the "storyteller", who selects one of his cards and makes up a sentence about it - it can be a one word sentence, can be sung, or whatever else you can think of. Often we would have sentences like "All dressed up with nowhere to go", or "I'm thinking of fish for dinner", or "Lucky devil". After the storyteller states his sentence, everyone else picks one of their cards that they think matches the same sentence and throw it in the middle. The cards are shuffled up and flipped over and then everyone (but the storyteller) uses their numbered pieces to secretly vote on which picture belonged to the storyteller. From here, points are awarded based on who voted for what, and the storyteller gets points if some (but not all) of the other players got the picture correct. The game goes on like this until the entire pile of cards has been used, at which time the player with the most points wins. Here's what sets apart Dixit from any other party game that I can remember playing: the storyteller's goal is to get some of the people to guess correctly. If he is so ambiguous that nobody can figure out his card, he gets no points and all the other players do; if he is so direct that everybody is able to get it correct, then, again, he gets nothing but all the other players score. Therefore, it is very fun and interesting to try to think of something just ambiguous enough to trick some people (and then hope that other players throw down other good cards that go well with the story that was used). This mechanic works really well, and is really the heart of Dixit. 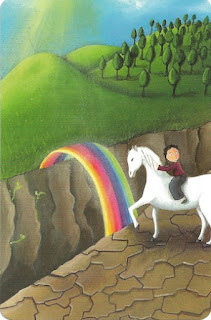 The next pro to Dixit is the ambiguity of the images themselves. The images are really just random fantasy pictures about nothing in particular. There are images of toys, cats, paintings, feasts, etc, but none of them are really about anything. On just about any of them you could say to yourself, "I have no idea what is going on there", and that's really the point. The art was very wonderfully created about... nothing. I can just imagine the designer of this game talking to the artist and saying, "Hey, I need you to create about 80 pictures of nothing in particular. Do you have a 5 year old kid around that we can use as a consultant? Maybe you can talk to him about what's going on in his mind and then draw it. Oh, he thinks that the sky is green and that it'd be neat to have raindrops that were filled with animals? Even better!" My final pro for Dixit is really that you don't have to know how people think in the game. Whereas in a game like Apples to Apples, how different people decide which card to pick is really important, in Dixit, you never know because the pictures are all so random. This prevents people from having a big advantage because they have known each other longer, or because they know that someone thinks certain things are funny - instead, it's all about how accurately you can adapt pictures about nothing to a story with no plot. My only real concern about Dixit is that you go through all of the cards every time that you play the game. Because of this, you are going to be reusing the pictures with each play. This means that it's up to you as the player to come up with creative new uses for the cards each time. Whereas this is something that will work wonderfully for artistic people, I think this might push the limits for my engineering friends' imaginations. Either way, this is really a neutral point more than a negative, because I think that part of the fun of the game may be in the challenge of seeing the same image over and over and making up new stories for it each time. Overall, I give Dixit a 9.5/10. This game has jumped to the top of my party game list, as it is something that is creative and fun, but is also something that could be engaging to both extroverts and introverts (no standing up and singing, or acting, or anything like that.... unless you want to). If you even mildly enjoy party games, I would definitely recommend trying Dixit out. If you like Dixit, you might also enjoy Say Anything, Fictionaire, and Rory's Story Cubes, or the Board Game Family's Dixit: Odyssey Review. Jash, great review! I'm not sure what the hitch is, but my friends and I (not all of them gamers, which I feel like its fine for this game) tried this twice and just didn't get it. We laughed a bit, but it didn't really feel as different as any other "one person picks something secretly and others try to match it" party games. I actually just shipped my copy in a BGG trade. That's fair. I know that not every game clicks with everybody. There have been a few games that I've heard great things about and then been pretty disappointed when I played. Oh well, thanks for the comment! Played it for the first time this weekend and loved the randomness of the images. Good for the imagination although I also worry that the pictures become too well known after a while. Good game for mixed ages and abilities - kept all players interested for at least two hours.